Okay, I've got a confession to make. During the last few rounds, I went back and forth between introducing both combatants in the same post and giving each of them their own post a week apart. I've decided the only way I'm going to do this is the latter - I just can't watching 13 episodes of two separate cartoons in one week. I've got a wife, and a kid, and a book I'm supposed to be editing. I hate having to do it this way, but it's the only way I can do it and keep a regular schedule. So with that out of the way, we're looking at Wildfire's villain, Lady Diabolyn. Evil sister of the once queen of Dar-Shan, her goal is gaining the crown from her niece and rightful ruler, Princess Sara. Diabolyn, while possessing an awesome name, has no powers of her own, instead relying on the Spectres of Darkness, a multi-faced cloud of smoke. The Spectres were trapped in an urn by Sara's father and pledged to help Diabolyn in her quest after she freed them. The Spectres' powers are pretty great, allowing Diabolyn to shapeshift into a dragon, cause lightning to strike, and turned her five minions, the Goons, from human into winged... things. Okay so that power isn't that impressive, though she was once able to summon a horde of similar goons from the Spectres. The only problem is that she needs to call on the Spectres any time she wants to use their powers, which backfired on her once when they decided to take matters in their own hands and abandon her. That episode, they were able to take human form, travel to the real world where Sara lived, shoot fireballs from their hands, summoned a horse, ropes, and lightning. Either they're holding back on Diabolyn or they weren't able to grant so many powers to her. Now we're going to take a look at Lady Diabolyn herself and what her typical plans were. Everything boiled down to making herself the ruler of Dar-Shan, but going about the weirdest ways, like making a golden dress out of fairy cocoon fibers just so she could look the part. She turned into a dragon in that episode, but thought the best way to steal the crown was looking pretty. She made a wish at a well that turned a frog into the king of Dar-Shan, and she decides to marry him. I'm sure the writers tried keeping her plans simple and superficial because they thought that's what girls would like, but it really hindered making her a good villain. 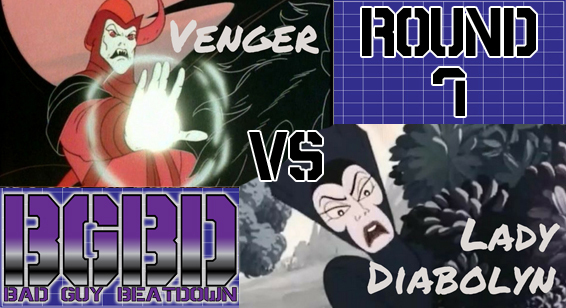 Next week, we're looking at her opponent, Venger from Dungeons & Dragons. It's funny how a random tournament generator pitted two magic users against each other. Makes for some interesting battles!